This guest post from Skeptical Science was written by Alden Griffith. Those who argue against taking action to address climate change generally justify their arguments with one underlying claim: "The science isn't settled." What exactly they think remains unsettled varies from person to person. Some don't think we can say for sure that the planet is warming. Others acknowledge that the planet is warming, but don't think we know how much of that warming is due to human influences. Others argue that we don't know if continued global warming will be bad, or how we can possibly solve the problem. Thus it's worthwhile to step back and take stock of the scientific literature - exactly what do we know, and what remains uncertain? We know the planet is warming from surface temperature stations and satellites measuring the temperature of the Earth's surface and lower atmosphere. We also have various tools which have measured the warming on the Earth's oceans. Satellites have measured an energy imbalance at the top of the Earth's atmosphere. Glaciers, sea ice, and ice sheets are all receding. Sea levels are rising. Spring is arriving sooner each year. There's simply no doubt - the planet is warming (Figure 1, below). Contrary to what some would like us to believe, the planet has not magically stopped warming. Those who argue otherwise are confusing short-term noise with long-term global warming. the underlying man-made global warming trend becomes even more clear (Figure 2, below). 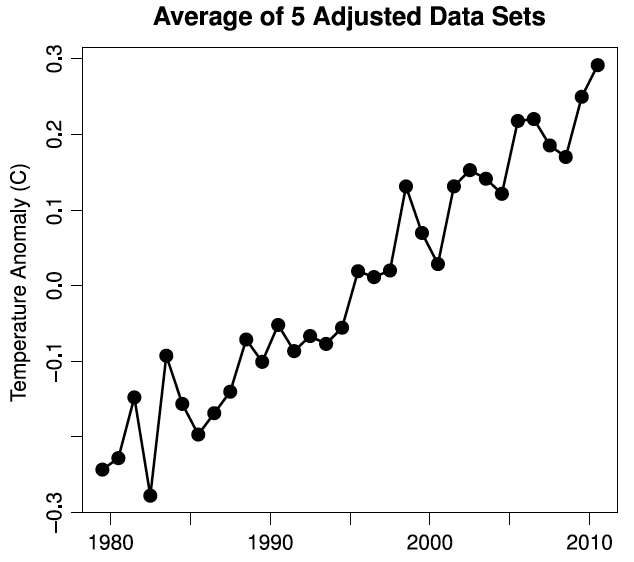 Average of the five main global surface and lower atmosphere temperature data sets after the effects of the sun, volcanoes, and ENSO have been filtered out. For as much as atmospheric temperatures are rising, the amount of energy being absorbed by the planet is even more striking when one looks into the deep oceans and the change in the global heat content (Figure 3, below). The amount of greenhouse gases in the atmosphere, particularly carbon dioxide (CO2), has been rising steadily over the past 150 years. There are a number of lines of evidence which conclusively prove that this increase is due to human activities, primarily burning fossil fuels. The most direct of evidence involves simple accounting. Humans are currently emitting approximately 30 billion tons of CO2 per year, and the amount in the atmosphere is increasing by about 15 billion tons per year. Our emissions have to go somewhere - half goes into the atmosphere, while the other half is absorbed by the oceans (which is causing another major problem, ocean acidification). There is overwhelming evidence that humans are the dominant cause of the recent global warming, mainly due to our greenhouse gas emissions. Based on fundamental physics and math, we can quantify the amount of warming human activity is causing, and verify that we're responsible for essentially all of the global warming over the past three decades. The aforementioned Foster and Rahmstorf (2011) found a 0.16°C per decade warming trend since 1979 after filtering out the short-term noise. In fact we expect human greenhouse gas emissions to cause more warming than we've thus far seen, due to the thermal inertia of the oceans (the time it takes to heat them). Human aerosol emissions [ed. note: not aerosols like from hair spray, rather some of the pollution from coal power plants and similar industrial sources] are also offsetting a significant amount of the warming by causing global dimming. Huber and Knutti (2011) found that human greenhouse gas emissions have caused 66% more global warming than has been observed since the 1950s, because the cooling effect of human aerosol emissions have offset about 44% of that warming. They found that overall, human effects are responsible for approximately 100% of the observed global warming over the past 60 years (Figure 4, below). Time series of anthropogenic and natural forcings contributions to total simulated and observed global temperature change. The coloured shading denote 5-95% uncertainty range. There are also numerous fingerprints which we would expect to see from an increased greenhouse effect (i.e. more warming at night, at higher latitudes, upper atmosphere cooling) that we have indeed observed (Figure 5, below). Climate models have projected the ensuring global warming to a high level of accuracy, verifying that we have a good understanding of the fundamental physics behind climate change. Much ado is made out of the expression "the science is settled". The science is settled in terms of knowing that the planet is warming rapidly, and that humans are the dominant cause. There are certainly unresolved issues. As noted above, there's a big difference between a 2°C and a 4.5°C warming for a doubling of atmospheric CO2, and it's an important question to resolve, because we need to know how fast the planet will warm in order to know how fast we need to reduce our greenhouse gas emissions. There are significant uncertainties in some feedbacks which play into this question. For example, will clouds act a a net positive feedback (by trapping more heat, causing more warming) or negative feedback (by reflecting more sunlight, causing a cooling effect) as the planet continues to warm? And exactly how much global warming is being offset by human aerosol emissions? These are the sorts of questions we should be debating, and the issues that most climate scientists are investigating. Unfortunately there is a there is a very vocal contingent of people determined to continue arguing the resolved questions for which the science has already been settled. And when climate scientists are forced to respond to the constant propagation of misinformation on these settled issues, it just detracts from our investigation of the legitimate, unresolved, important questions. But there is arguably no more important object than the global climate. We rely on the climate for our basic requirements, like having enough accessible food and water. here and here and here.). We already have all the technology we need. Opponents often argue that mitigating global warming will hurt the economy, but the opposite is true. Those who argue that reducing emissions will be too expensive ignore the costs of climate change - economic studies have consistently shown that mitigation is several times less costly than trying to adapt to climate change (Figure 6, below). Approximate costs of climate action (green) and inaction (red) in 2100 and 2200. Sources: German Institute for Economic Research and Watkiss et al. 2005). This is why theres is a consensus among economists with expertise in climate that we should put a price on carbon emissions (Figure 7, below). New York University survey results of economists with climate expertise when asked under what circumstances that USA should reduce its emissions. The bottom line is that from every perspective - scientific, risk management, economic, etc. - there is no reason not to immediately take serious action to mitigate climate change, and failing to do so would be exceptionally foolish. The big picture is that we know the planet is warming, humans are causing it, and there is a substantial risk to continuing on our current path. We don't know exactly how large that risk is, but it's not an excuse not to act.